Red Knight Entertainment is having a sale on their Materion sci-fi terrain pieces. Materion Future Tech 15/20/28mm Terrain For Sale! Also previewing Future Apocalyptic Terrain! Our Materion Future Tech Terrain is now for sale. It costs $12 for the first 400 customers worldwide then will be permanently restocked at $16. 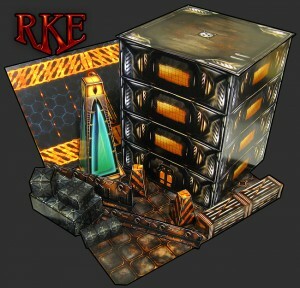 Also here is a preview of the upcoming Future Apocalyptic Terrain for 15/20/28mm scales. It will have 32 different corner pieces with holes in the walls and 3 different sizes of sniper perches that you can cut slits for and fit along the corners wherever you wish. The Future Apocalyptic Terrain will also have 25 destroyed street tiles as well as all the city props from the Future Tech set (Billboards, pipes, walls, security pillars, crates, obelisk) but with an apocalyptic grunge decor. Large preview coming soon!